"My Nonnie used to make this potato salad for me whenever I was home for the holidays. 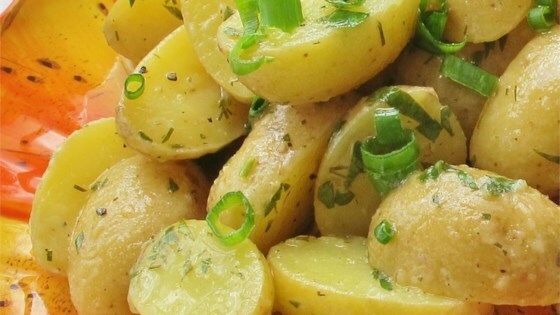 It's a great alternative to mayo-based potato salads. Red wine vinegar works well, too." this is agood recipe,especially in the summertime. I would only add a couple of things, though. I would use a little less vinegar, and bring it to room temp. before you serve it. Tasty!!! Too much vinegar. Loved the garlic and added celery. If I make this again I will cut the vinegar way back. Wouldn't make again. Too strong of a vinegar taste! This is the best italian potato salad we have ever had!